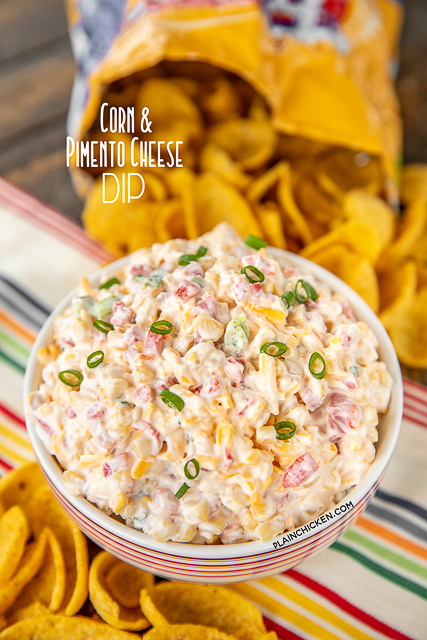 Corn & Pimento Cheese Dip - a quick and easy dip that is great for watching The Masters and all your spring and summer cookouts! Can serve as a dip with chips or as a side dish. Corn, pimentos, green onions, garlic salt, cheddar cheese, mayonnaise, and sour cream. Can make in advance and refrigerate until ready to serve. I can't go to a party without bringing this dip! I never have any leftovers! Masters week is finally here. This is a big week in our house. Chicken Legs will be glued to the laptop and TV all week watching the golf tournament. I am whipping up a few Masters-themed snacks for us to eat while we watch the golf. There will be Egg Salad, Pimento Cheese and maybe a few Azalea Cocktails. 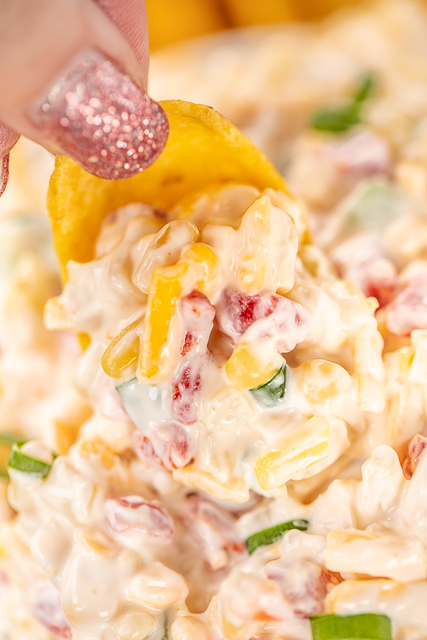 A new treat for this year's watch party is this yummy Corn & Pimento Cheese Dip. 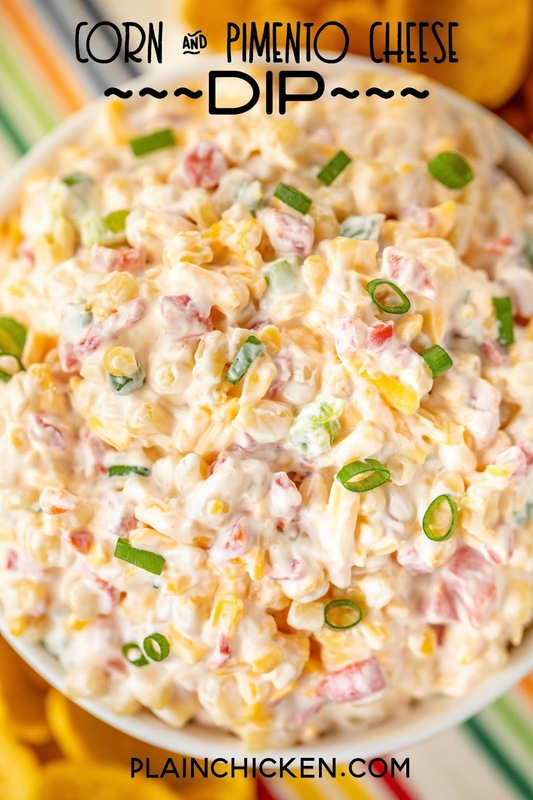 It is a corn salad combined with pimento cheese. YUM! It is crazy good. We served it as a dip, but it would also be great as a side dish at your upcoming spring and summer cookouts. Pimento Cheese is a traditional Southern recipe that is, in its simplest form, cheese, mayonnaise, and pimentos. It can be used as a spread, dip, on top of a burger, in a sandwich. The Masters is famous for their pimento cheese sandwiches. It is a tradition to have an Egg Salad Sandwich and a Pimento Cheese Sandwich while watching the golf tournament. This Corn & Pimento Cheese Dip is very simple to make. Simply dump the corn, pimentos, cheese, and chopped green onions in a bowl. Add mayonnaise, sour cream and garlic salt to the bowl and stir. That is it. The hardest part about making this dip is chopping the green onions. I like to use scissors and cut the onions right over the bowl. Easy peasy! Can Corn & Pimento Cheese Dip Be Made in Advance? Absolutely! I like to make this Corn & Pimento Cheese Dip a day in advance so the flavors have time to come together and chill. We like to serve the dip with Fritos. You could also serve this with some celery sticks, endive or bell pepper slices. This Corn & Pimento Cheese Dip is a great addition to your Masters watch party or any upcoming spring/summer party! This makes a lot. Feel free to half the recipe if you aren't expecting a crowd. As I said, this can be served as a dip or as a side dish. 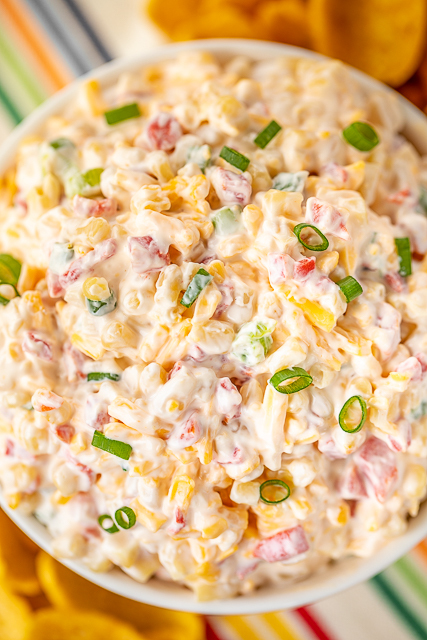 Heck, serve half as a dip and half as a Pimento Cheese Corn Salad. I love that you can make this in advance. Easy party food is my favorite! Mix together all ingredients and refrigerate for several hours. 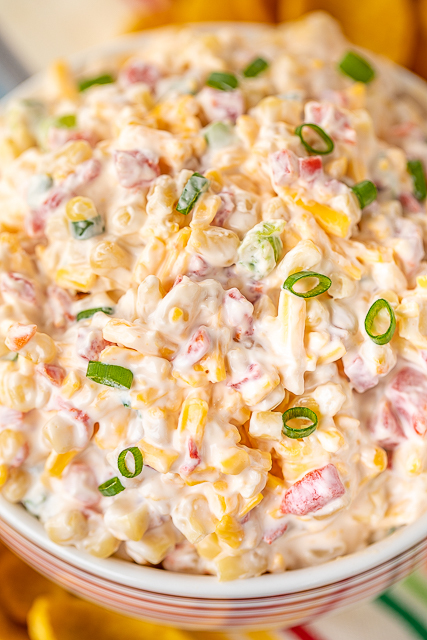 This is also good as a side dish - Pimento Cheese Corn Salad. It is delicious at cookouts. i have a new love for pimento cheese - i still want to make that bruschetta we had! this looks great!